This entry was posted in cystic fibrosis and tagged cystic fibrosis, cysticlife, fighting cf, sharktank.org by unknowncystic. Bookmark the permalink. I have tshirts for the CF walk every year. This year I’m making new ones – maybe i’ll send you one… and get your feedback. I think I remember seeing the t-shirt on your blog. Very nice. Pls send a jpeg when you get the new one finished. I like it! Really, I do. I’m not good at the whole “planning” thing, but I’d love to participate and spread the word! Thanks. I think it would be cool. I wonder how many are out there fighting the fight. Sounds like a good idea. Think you will have trouble with the CF Foundation wanting to help coordinate during any other time during the CF Awareness week in May. I agree with you. Thanks for the information. I forgot about that week. One day in the week would be perfect. I think it would work even if there wasn’t ONE shirt. 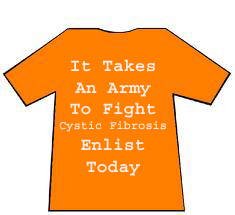 If people wore ANY shirt that was explicitely to fight CF, it would work! That would be great so that those who didn’t have time to buy THE SHIRT could still participate! You are awesome. Pick a date!! It might work with other shirts. Still, in my warped mind I pictured one large wave of color taking over the country. Thanks for the visit and comment. I’ve been following your exercise numbers. Keep it up. I’ve heard of that shirt. The woman who created the idea in the UK is on Twitter. She asks celebrities to wear the shirt and take a picture of themselves with it on. It’s very cool that you ordered one. I wish you the best in 2011. I LOVE this idea! We should spread it on facebook and twitter and cysticfibrosis.com. 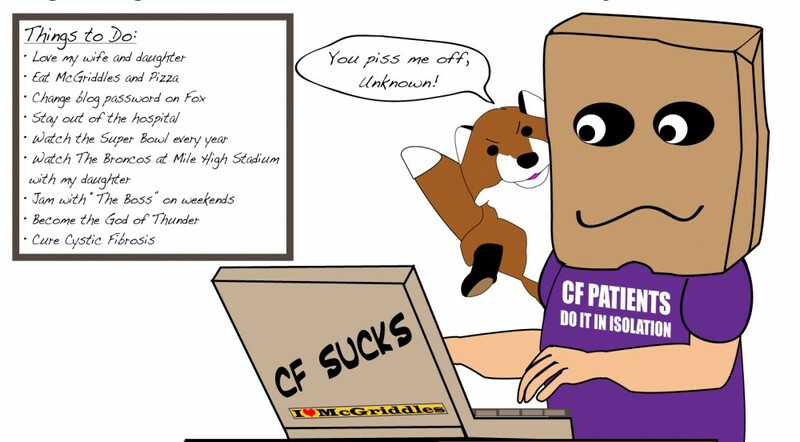 This could definitely work…though I dont look good in lime or yellow….I think something like purple, it is afterall the color for CF awareness. You are so right about purple being the color of the foundation. How did I forget that? I guess I was thinking that it had to be a color that really stood out, but I think purple would work well, too. Thanks for sharing your advice. Much appreciated. I’m going to be selling CF t-shirts next week!! !